Shares (in millions) Weighted Average Grant date Fair value RSUs PSUs RSUs PSUs Nonvested at January 1 1.5 0.3 $ 56.19 $ 58.10 Granted 0.6 0.1 76.61 81.14 Vested (0.7) (0.1) 55.71 56.53 Canceled (0.1) — 63.45 57.12 Nonvested at December 31 1.3 0.3 $ 65.04 $ 66.18 At December 31, 2014 there was $45 of unrecognized compensation cost related to nonvested RSUs. That cost is expected to be recognized as expense over the weighted-average period of 0.9 years. The weighted-average grant date fair value per share of RSUs granted in 2014 and 2013 was $76.61 and $60.81, respectively. The fair value of RSUs vested in 2014 was $39. At December 31, 2014, there was $9 of unrecognized compensation cost related to nonvested PSUs; that cost is expected to be recognized as expense over the weighted-average period of one year. Employee Stock Purchase Plans (ESPP) Full- time and part-time employees may participate in our ESPP provided they meet certain eligibility requirements. The purchase price for our common stock under the terms of the ESPP is defined as 95% of the closing stock price on the last trading day of a purchase period. During 2014 and 2013, we issued 150,167 and 163,533 shares, respectively, under the ESPP. 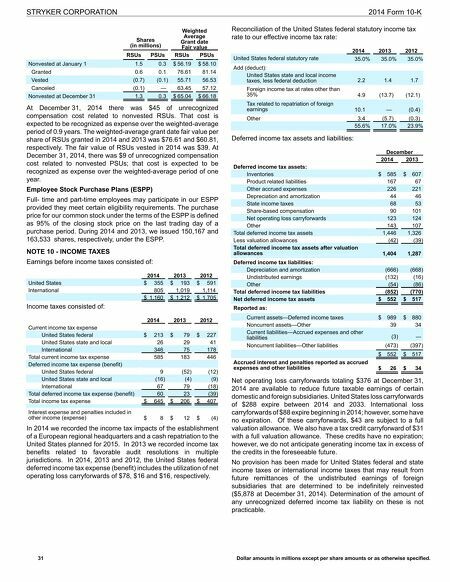 STRYKER CORPORATION 2014 Form 10-K 31 Dollar amounts in millions except per share amounts or as otherwise specified. NOTE 10 - INCOME TAXES Earnings before income taxes consisted of: 2014 2013 2012 United States $ 355 $ 193 $ 591 International 805 1,019 1,114 $ 1,160 $ 1,212 $ 1,705 Income taxes consisted of: 2014 2013 2012 Current income tax expense United States federal $ 213 $ 79 $ 227 United States state and local 26 29 41 International 346 75 178 Total current income tax expense 585 183 446 Deferred income tax expense (benefit) United States federal 9 (52) (12) United States state and local (16) (4) (9) International 67 79 (18) Total deferred income tax expense (benefit) 60 23 (39) Total income tax expense $ 645 $ 206 $ 407 Interest expense and penalties included in other income (expense) $ 8 $ 12 $ (4 ) In 2014 we recorded the income tax impacts of the establishment of a European regional headquarters and a cash repatriation to the United States planned for 2015. In 2013 we recorded income tax benefits related to favorable audit resolutions in multiple jurisdictions. 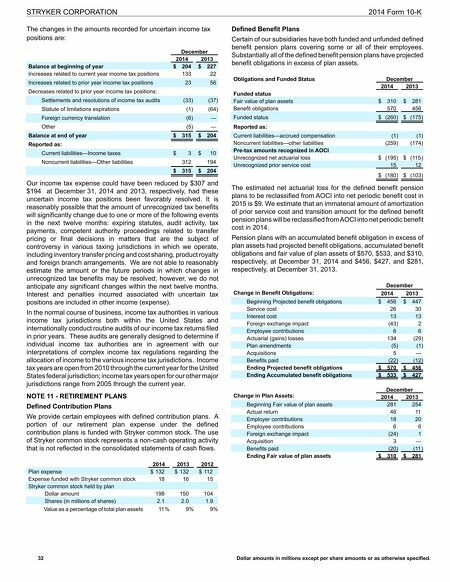 In 2014, 2013 and 2012, the United States federal deferred income tax expense (benefit) includes the utilization of net operating loss carryforwards of $78, $16 and $16, respectively. Reconciliation of the United States federal statutory income tax rate to our effective income tax rate: 2014 2013 2012 United States federal statutory rate 35.0 % 35.0 % 35.0 % Add (deduct): United States state and local income taxes, less federal deduction 2.2 1.4 1.7 Foreign income tax at rates other than 35% 4.9 (13.7 ) (12.1 ) Tax related to repatriation of foreign earnings 10.1 — (0.4 ) Other 3.4 (5.7) (0.3) 55.6% 17.0% 23.9% Deferred income tax assets and liabilities: December 2014 2013 Deferred income tax assets: Inventories $ 585 $ 607 Product related liabilities 167 67 Other accrued expenses 226 221 Depreciation and amortization 44 46 State income taxes 68 53 Share-based compensation 90 101 Net operating loss carryforwards 123 124 Other 143 107 Total deferred income tax assets 1,446 1,326 Less valuation allowances (42) (39) Total deferred income tax assets after valuation allowances 1,404 1,287 Deferred income tax liabilities: Depreciation and amortization (666) (668) Undistributed earnings (132) (16) Other (54) (86) Total deferred income tax liabilities (852) (770) Net deferred income tax assets $ 552 $ 517 Reported as: Current assets—Deferred income taxes $ 989 $ 880 Noncurrent assets—Other 39 34 Current liabilities—Accrued expenses and other liabilities (3 ) — Noncurrent liabilities—Other liabilities (473) (397) $ 552 $ 517 Accrued interest and penalties reported as accrued expenses and other liabilities $ 26 $ 34 Net operating loss carryforwards totaling $376 at December 31, 2014 are available to reduce future taxable earnings of certain domestic and foreign subsidiaries. United States loss carryforwards of $288 expire between 2014 and 2033. International loss carryforwards of $88 expire beginning in 2014; however, some have no expiration. Of these carryforwards, $43 are subject to a full valuation allowance. We also have a tax credit carryforward of $31 with a full valuation allowance. These credits have no expiration; however, we do not anticipate generating income tax in excess of the credits in the foreseeable future. No provision has been made for United States federal and state income taxes or international income taxes that may result from future remittances of the undistributed earnings of foreign subsidiaries that are determined to be indefinitely reinvested ($5,878 at December 31, 2014). Determination of the amount of any unrecognized deferred income tax liability on these is not practicable.